Dr. Robert Mansueto's charges continue to pile up. 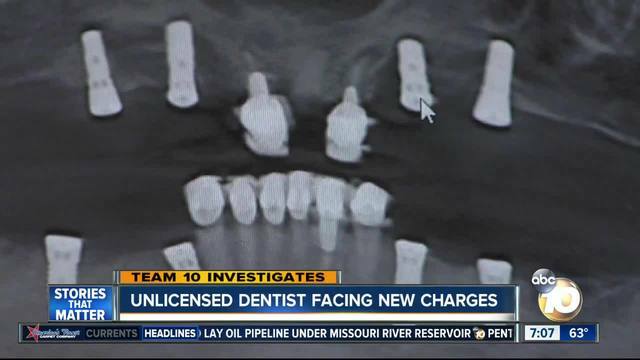 On the first day of his preliminary hearing he was hit with three felony counts of practicing dentistry without a license. He already had 20 counts on the books. Team 10 first exposed Mansueto last spring after following him as he drove patients from his Coronado home to a clinic in Tijuana, Mexico for dental implants. 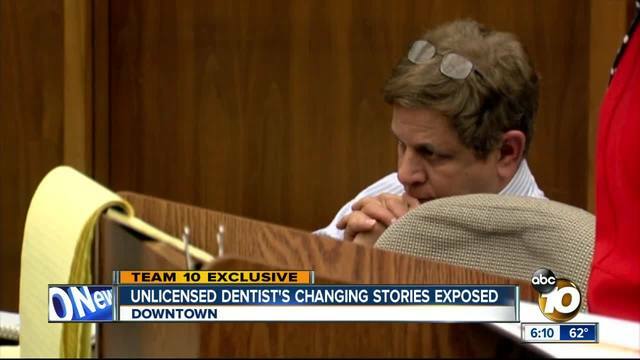 The problem was Mansueto's license to practice dentistry in California was revoked more than a decade ago, and he told patients his name was Dr. Bob Franco. Prosthodontist Dr. Daniel Kantarovich was the first prosecution witness at Mansueto's preliminary hearing. He testified he believed Mansueto took risks with patients by not taking adequate medical histories, x-rays and CAT scans to make sure the patients were qualified for implants. Kantarovich explained that bone density is an important factor that dentists should pay attention to before placing titanium screws into patients' jawbones. Without taking such measures, Kantarovich explained, the patients could be at risk of great bodily harm. Kantarovich, who did not examine or interview Mansueto's patients told the court that one of them began bleeding profusely on the drive back from Tijuana. “On the way back to the US the patient began bleeding in the car, her sutures opened up and there was no form of suppressing the blood," Kantarovich said. “A piece of paper in the car was given to her which she had to try to put pressure on the area. A piece of paper is obviously not sterile or clean, found in an automobile, by the sutures opening up and bleeding in the auto there always is a risk of introduction of bacteria from the piece of paper and from the mouth and potential subsequent infection," he added. On cross examination, Mansueto's attorney asked whether Kantarovich's opinions about the case might change if he actually saw the reports and talked to the witnesses rather than relying on information provided by the prosecution. He said it's possible. Gretchen Von Helms suggested the victims may not have remembered what happened clearly and hinted that another dentist at the clinic may have actually done the procedures. The preliminary hearing continues Thursday when an investigator from the California Dental Board takes the stand. When her testimony is complete, the judge will decide if there's enough evidence to hold Mansueto over for a jury trial. If convicted, Mansueto faces up to 13 years in prison. Team 10 will post the judge's decision as soon as it's known.